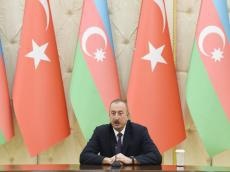 The Azerbaijani-Turkish relations are at a high level, Azerbaijani President Ilham Aliyev said July 10. He was making press statement jointly with Turkish President Recep Tayyip Erdogan. Turkish President Recep Tayyip Erdogan made his first visit to Azerbaijan after the election, which is an example of the Azerbaijani-Turkish brotherhood and this once again shows the unity of the two countries, Ilham Aliyev said.